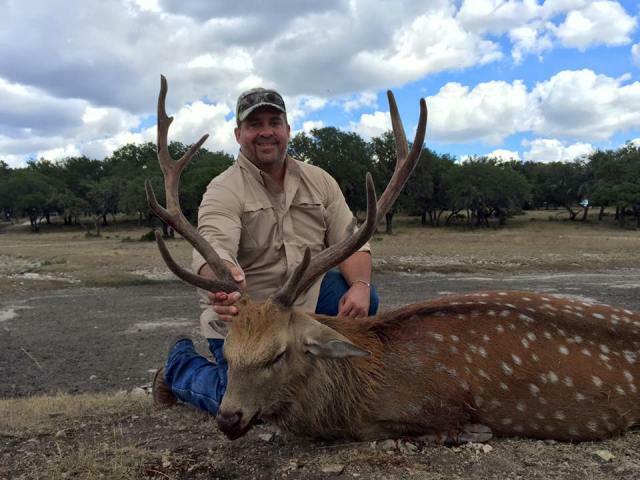 A good friend and hunting client Doug had been wanting a giant Sika deer for a long time. He can check that one off the list! Doug wasn’t interested in the typical Japanese Sika and I had told him to hold off and let some of our Dybowski get bigger well looks like that waiting paid off big time. Preliminary measurements have Doug’s Trophy Dybowski Sika measuring in the top 10 for Trophy Game Records. Congrats Doug on a great Dybowski Sika buck! Cam Pics! Going to be a good year! Forister Exotics Game Cam Pics! Here are a few game cam pics of some animals here at Forister Exotics( all of these pics are this years animals time stamps may not be set correct on all the cams! ), Some of you are already booked to come take a crack at outsmarting some of these trophies….the rest of you whats your hold up!! Call today and lets get you on the calendar. Also check us out on facebook! Well the first weekend of archery whitetail season came and went without much excitement on the whitetail end of things but we finished the 2nd weekend with some excitement. Doug brought his father Louis out for a good whitetail and I think we got a good one. The hunting was really slow and being a bow hunt we didn’t have a lot of options. Doug and Louis sat over a feeder in a popup blind for 2 days seeing tons of deer at one point they had 28 deer in front of them but mostly young deer and doe and a few exotics. 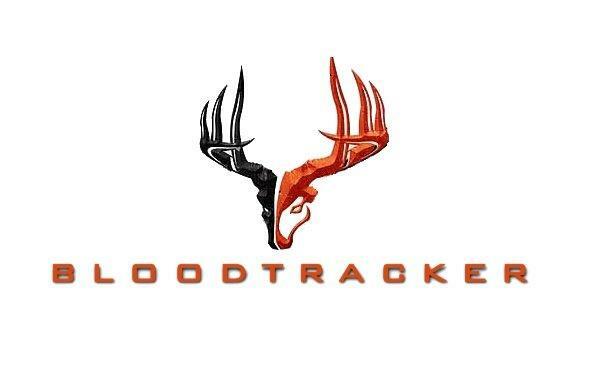 Each sit we did something a little different either by adjusting the feed time, run time, corn with the truck, corn without the truck, just trying to coax one of the bigger bucks to make a mistake and come in. The second morning they thought one of the big boys came in and fed before daylight but before it got to legal light he was gone. So after the last morning hunt I asked Doug what he though if maybe we tried to make a couple pushes just to see if we could locate one of the bigger whitetail deer and maybe just maybe make a play on him. Doug and Louis agreed it might be worth a shot. Well first pass 2 big deer slipped pass out of range so we decided to try again in another spot. Once they got set up I left and got around the pasture to try to push again and I saw a group of good whitetail bucks. I knew it was about to get interesting. I started slowly trying to get them to cooperate and go the right direction. Once I felt they where and would come out to the right opening I proceeded to push them. They got around and came right across in front of Louis and after looking them over he decided this buck was his best shot being closest to him and having a few of the deer already down wind of them he knew they would probably spook very soon. So once he settled the crossbow and got the deer in his sights he let one fly and drove it into the Whitetail bucks shoulder. From where I was I heard the shot and the impact and I thought it sounded good so I made my way up to where they where set up. Doug was congratulating his dad so I knew it must have been a good shot. After a short track job we found this great whitetail buck at the end of the blood trail. 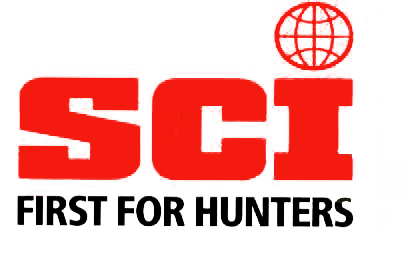 All that was left to do was get some pics of the happy hunter and get him to the skinning pole. 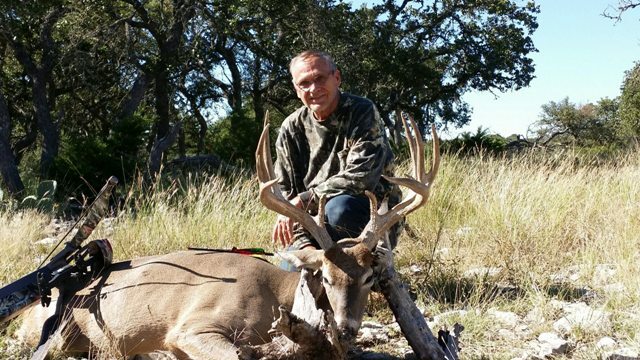 The deer scored right at the B&C line 172″ Congrats Louis on a whitetail buck of a lifetime!! After the shot Doug called it my Mouflon Sales tactic, That is to drive around continuously looking at big Mouflon and the hunter or someone in the truck will eventually say ” I’ll shoot that one” !! Well we had been looking for a couple of fallow bucks for a good part of the day for another hunter in the group and we had already harvested a nice Blackbuck. We kept running into a group of Mouflon and this time I guess they were just tired of running away from us and we got a chance to really look at them and pick out a good old Mouflon Ram. 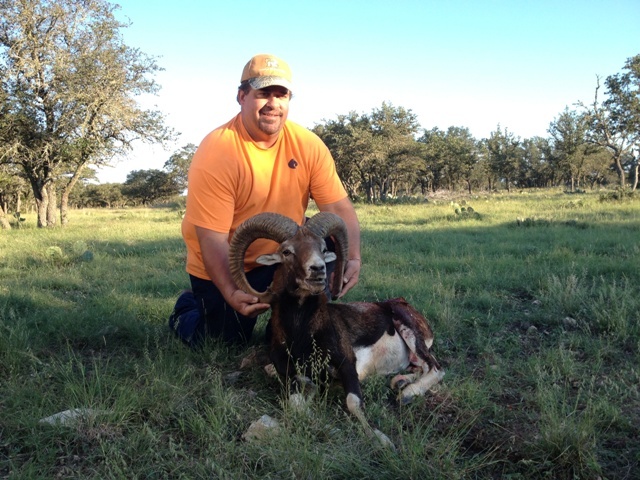 Once we had our Mouflon Ram picked out Doug was quick to pull the trigger and made a tough quartering shot that stopped the Mouflon in his tracks. 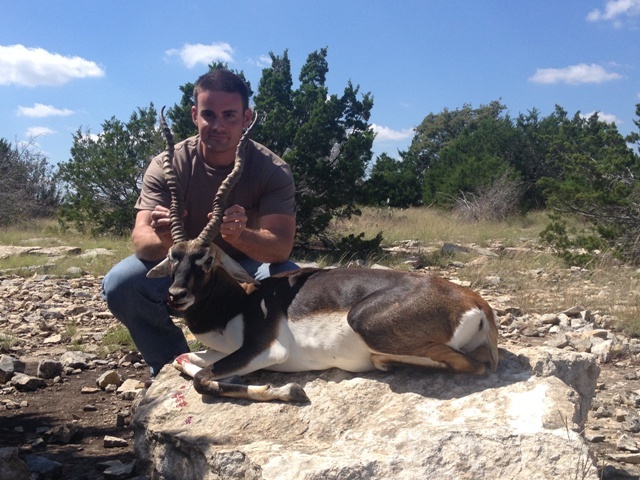 Once we got up on him we quickly realized we had a a pretty nice old Mouflon on our hands. Congrats Doug and this one will go great on the wall. Accidental Sika in the Rain! Keith and Joe had booked a hunt back in August for this past weekend. Keith has hunted a few times over the summer and harvested a few animals on a mission to train his new blood dog TJ. After deciding we might like to look for a big Mouflon possibly for both hunters we made our way around the pasture in the rain looking for the biggest Mouflon we could find. After a couple of almost shot opportunities we were set up on the herd trying to pick the biggest one when Keith asks ” Hey what the heck is that coming out in the back?” I quickly shifted my binoculars to the back of the herd and there was this Impressive Sika Buck working his way along the cedar line at about 200 yards. Keith quickly got the deer in focus and made what we thought was a pretty good first shot on the Sika Buck. We gave him a few minutes and with TJ in tow we set out before the rain could was the blood and scent away. As we approached where the Sika buck went into the cedar at TJ quickly picked up the trail and before we knew it he had jumped the big Sika Buck and the chase was on. We quickly caught up to the next cedar break and TJ had lost the Sika Buck. As we watched him work the trails TJ locked on again and Keith was able to get another shot off on the Sika buck. This time the Sika buck went down for good and we let TJ finish tracking him out. What a great learning experience for TJ who is showing signs of being a valuable asset for Keith hopefully for many years to come. 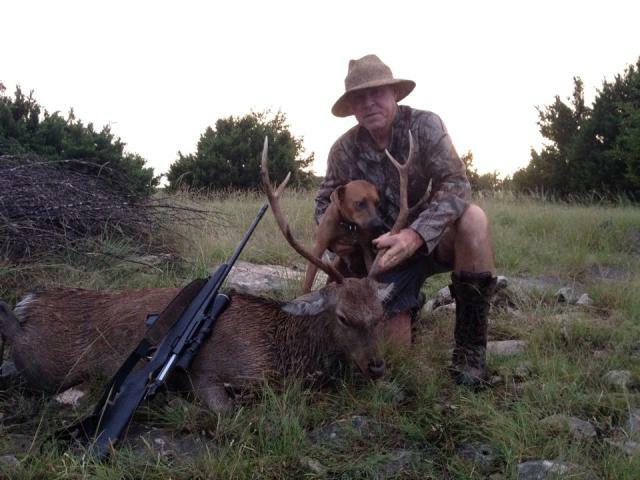 Oh yeah and Keith had his hands on a very impressive Sika buck to boot. Congrats Keith on an awesome hunt and finally getting a good work out for TJ.